"Oh, Dakuwaqa!" - The Shark comics and cartoons: I think we should hug now. I think we should hug now. How can I say this without sounding completely inhuman? ... 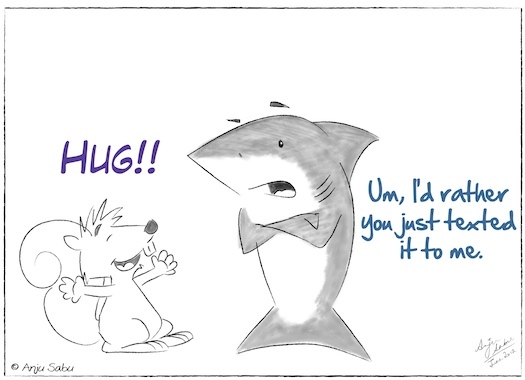 I'm not one of those people who hugs someone every time something (or even nothing) happens. I think hugs are great when necessary or when you're caught up in the moment. But when they're doled out like they were free samples of food, they don't seem as special during the times of need, right? It's pretty funny how most of my friends who know this about me either tell everyone else not to hug me or make sure everyone does hug me. 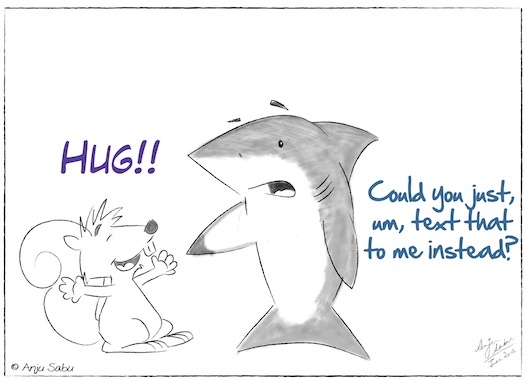 That being said, we all need hugs every now and then. Even sharks. I actually did two versions of this sketch and decided I liked the above one better but here's the other one anyway.